Think the narrator of your eLearning course isn’t all that important? Think again. The voice that accompanies your content can make a major impact on not only how successful the course is at teaching, but how it is perceived overall. Amateur audio/narration is easy to spot. Do you want to send up a red flag with your clients and learners? Probably not. Let’s look at this topic through examples and talk about what benefits accompany working with a professional narrator when building your eLearning course. Think about some of the well-known narrators of our time. These are the people who narrate documentaries, movies, and television with aplomb. Edward Hermann. James Earl Jones. Morgan Freeman. They are successful because they narrate with confidence—and their voices are memorable. Freeman’s deep, recognizable voice with thoughtful inflection takes a seemingly uninteresting scene and transforms it into a compelling, interesting story. The same can happen for your eLearning course. A professional narrator can elevate your material to another level, and make a dramatic impact on the overall quality of the course itself. –Efficient recording. Your expert narrator gets it right the first time, and doesn’t have to invest a lot of time into re-dos, edits, and pausing to check the sound. –High-quality production value. Professional narrators have the right equipment and tools to record audio that sounds fantastic. You don’t have to worry about background noise, static, and poor sound quality. –The right tone. A great narrator has a special kind of voice that resonates with learners. It’s easy to understand, clear, and trained to know when to pause or speed up. Professional narrators know how to use their voices to tell a story, not to simply read from a note card. Different courses require different tones to fit the content and the audience it’s intended for. This is one of the most compelling aspects of a professional narrator. 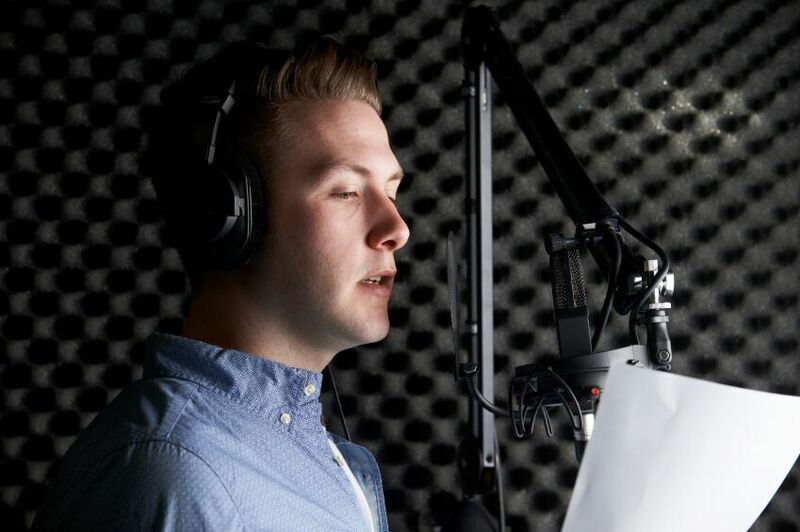 Even that person in the office who people think “has a nice sounding voice” isn’t necessarily going to come across like a professional narrator will. Beyond that, will the novice person be able to convey the right emotion, hold down a true conversationally casual tone (most novice narrators get overly formal when they narrate), or provide the right “character” for your course? There is a lot more subtlety to narration than people think. While many can’t say exactly what they want from a professional narrator, almost everyone can identify an amateur narrator after hearing them. You need to determine if this amateur tone is really the vibe you want to be giving off. Many people shy away from professional narration for cost reasons, but this shouldn’t be the case. If you’re just doing small informal courses that are only being presented internally, then maybe you don’t want to invest money. But for any project of real consequence, a professional narrator can actually be cheaper than the time it takes to get amateur audio. Amateurs typically take far more time to do the recording and there are many more re-takes requested by the reviewers. There’s also time spent cutting up and producing the audio clips if you do it yourself. Depending on how you value time, a professional narrator can actually cost less; not to mention you’ll have a better end product. Not sure where to look for an eLearning narrator? You could start by looking in your existing network. You may be connected to narrators already. For example, we get contacted by potential narrators every week to assist with our projects. Maybe you have some of these people in your network as well. You can also try asking around to find local talent or pursuing online options. There are many, many different avenues for narration. No matter which way you go, remember to vet your narrator for eLearning specific work to be sure it’s a good fit. Listen to work samples, ask for them to record a small segment of your content, and ensure they give you “finished” audio that you can drop directly into your courses. Think about using a narrator to really make an impression on learners, and see if hiring a professional with work with your budget on the next course you create. Now that you know the importance and how dramatically it can improve your course, it’s time to seriously consider working with a pro.